So this is thirty. Another year around the sun, another number added to my age. When I was younger, my 30th birthday appeared so far away. The only experience with 30th birthdays I had to rely on was a Friends episode—"The One Where They All Turn Thirty." As the show flashbacked with vingettes of everyone's milestone birthday, I falsely assumed that as I aged I would have as many regrets and crying episodes as the characters. But, at thirty years old today, I feel right. I feel none of the anxiety and distress as I did on my 25th birthday when I despaired that my childhood was over. There have been no tears, crises, or wishful holds onto my youth. Instead, I feel at peace with myself. I'm finally at a place in my life where everything is coming together. It was a big year for me. After an exhausting home search, I moved into my dream house last June with Chris, my boyfriend of eight years. Almost a year later, we've added our own personality to the space (though there are still many projects left to go). Even though I resisted it for many years, it feels good to put down roots. I'm wrapping up my third year at my current high school as a science teacher. Although the change to pursue teaching instead of baking was an unexpected turn in my life, these students have created a place in my heart. I cannot imagine I will ever tire of watching them learn and grow as young adults during the time we have together. And, because I don't have enough on my plate, I also thought it was a good idea to take 18 graduate credits this spring on top of working a full-time job and blogging. News flash: It was a terrible idea, but I survived. Who enjoys free time anyway? Not me, apparently. This past year I also fell back in love with baking. I've had mixed feelings about baking and blogging the last few years, finding the responsibility exciting one day and like a chore the next. After realizing that I was holding myself to impractical standards (that were not right for me anyway), I loosened the expectations I had for myself. In this reinstated freedom, I rekindled a new love for a longtime hobby. The idea for this coconut cake has been in my head for years. I held myself back, though, waiting until I felt an occasion was "special" enough to turn it from dream into reality. Eventually I realized that this line of thinking was ridiculous—why was I stopping myself from enjoying a cake infused with one of my favorite flavors? 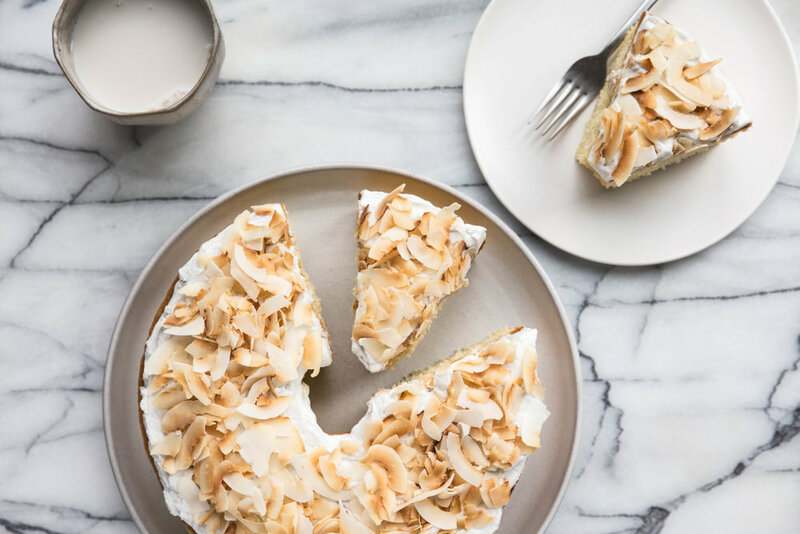 This coconut cake features coconut in every component. The cake is made with coconut oil, coconut milk, and coconut extract for an added touch. Covered in coconut whipped cream and sprinkled with toasted coconut, the cake is truly a coconut lover's dream. I enjoy the cake with an extra dollop of whipped cream and a handful of berries on top every slice. I recommend you do the same. Cheers to another year, my friends. May we enjoy growing older as much as we enjoy eating cake! This Coconut Cake starts with a coconut infused batter. The cake itself falls on the denser side of the spectrum, but stays fresh and moist. 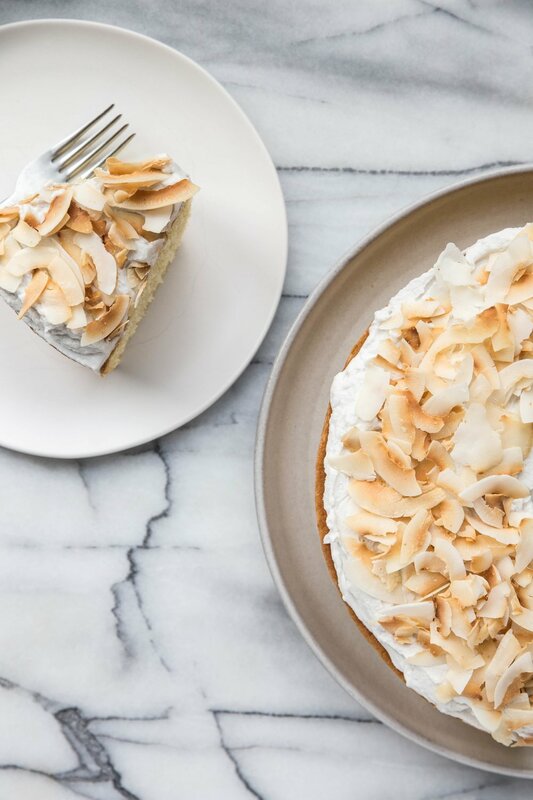 Topped with coconut whipped cream and toasted coconut flakes, the cake is ready to be served. Enjoy with an extra dollop of whipped cream and a handful of fresh berries. Preheat oven to 350 degrees F (180 degrees C). Heavily grease and flour a 10-cup tube or bundt pan. Set aside. In a large mixing bowl, whisk together the granulated sugar, coconut oil, 4 egg yolks, vanilla extract, coconut extract, salt, and baking powder until uniform. Alternate adding the flour, coconut milk, and milk, stirring after each addition until the batter is smooth and uniform in appearance. In a separate mixing bowl, beat the 4 remaining egg whites until stiff peaks form. Gently fold the egg whites into the cake batter just until uniform. Pour batter into the prepared baking pan and bake for 45-55 minutes, or until a toothpick inserted into the center comes out clean. Allow cake to cool in pan for 15 minutes before unmolding and cooling completely. Immediately before serving, top the cake with a layer of coconut whipped cream and toasted coconut flakes. Serve with an additional side of whipped cream and berries. Refrigerate leftovers. Allow the cake to come to room temperature before serving for best texture.